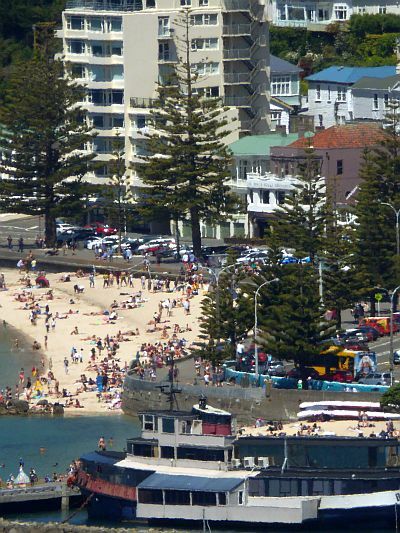 I am fond of this picture of the beach at Oriental Bay I took from the top of the botanical gardens, on the other side of the harbour, on a very hot Boxing Day almost exactly one year ago. It is an uncharacteristic Wellington, bathed in visible heat. But this is a city that knows how to be pretty. 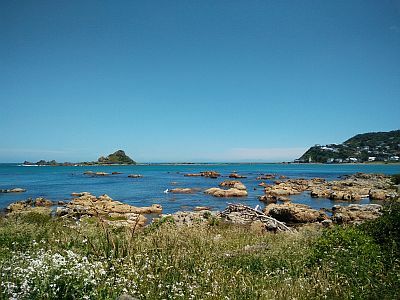 I’ve taken to walking along the South coast. And loop back around the forest at the back of the zoo. 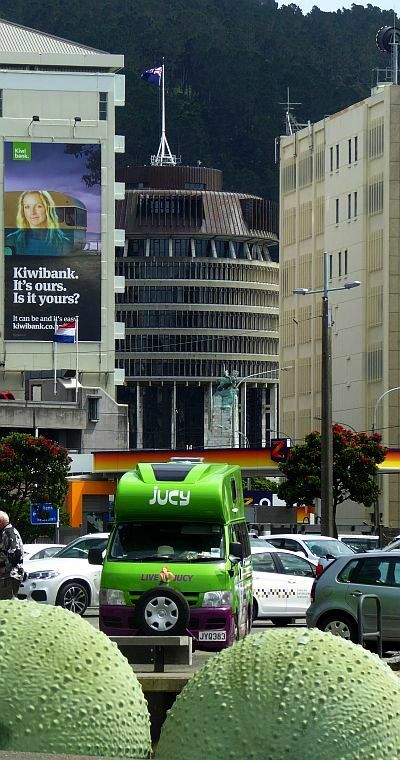 But always in Wellington we are faced with the awareness of the city’s uncertain, unstable geography. 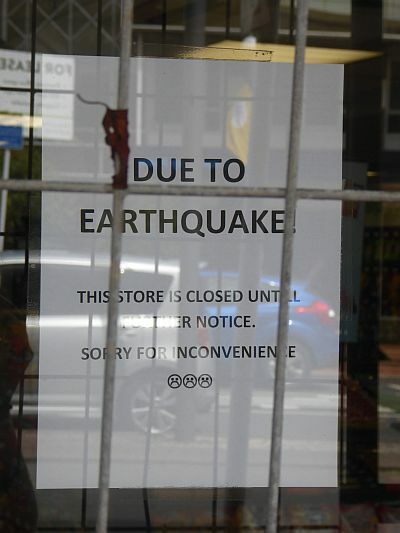 A very large earthquake centred 100 miles away has made this a common sight. 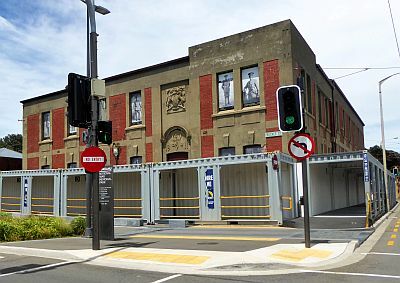 The state of the Reading car park – a building people use to spend the day in the business district – caused the closure of half of Courtenay Place. 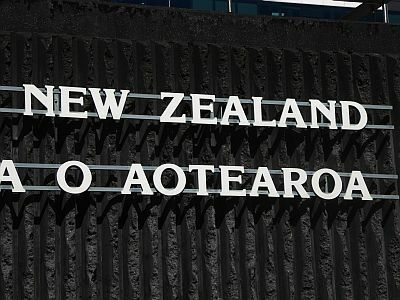 The feared imminent collapse of a commercial building in Molesworth Street forced the evacuation of the headquarters of the Red Cross. Does any of this qualify as irony? At any rate, the building is being ‘deconstructed’. 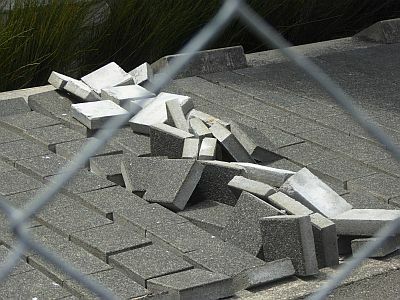 There is nothing like an earthquake to make us notice the built features that lean needlessly over our heads. 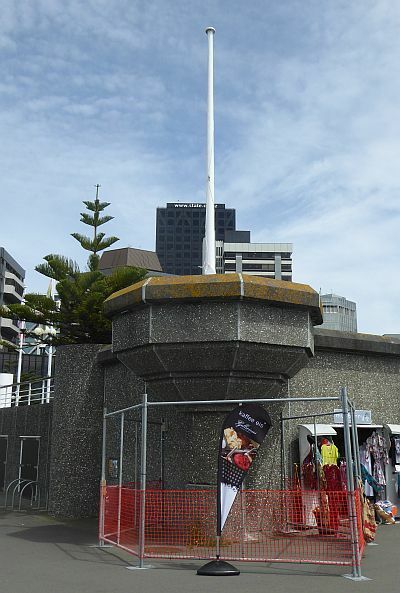 This one was fenced off along the waterfront. In the most alarming incident, one of the floors of the recently built Statistics House pancaked during the quake, which thankfully happened in the middle of the night. They say the repairs will take a year. On the outside, you can see exactly where the fault line runs. It made the paving stones pop up like corn kernels in a pan. And if you walk around the building, you can trace the fault line again. The state-of-the-art BNZ headquarters next door are fenced off, too. 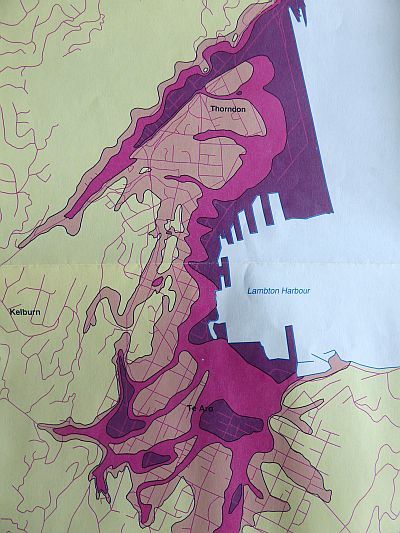 I go the library and check the earthquake risk maps. Look at the ground underneath those buildings. Our prime real estate. The darker the colour, the greater the shaking. 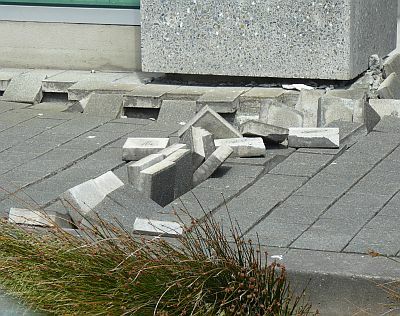 Even before the Kaikoura earthquake, the GHQ building was encircled with an armoured sidewalk as a precautionary measure, while the fate of the listed site is decreed. 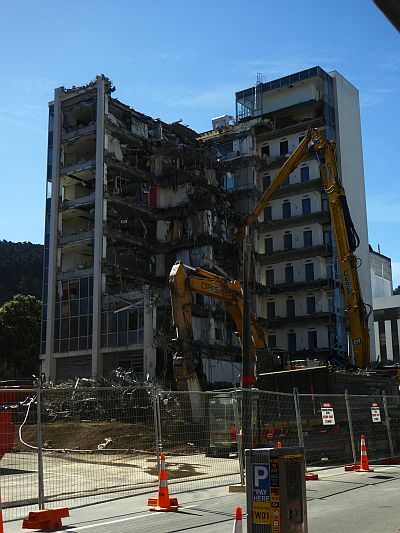 That is the negotiation that is always going on in Wellington, between safety and heritage value, or between safety and character. Anything that is of a certain age, and ornate, seems especially fragile (whether it is true or not). 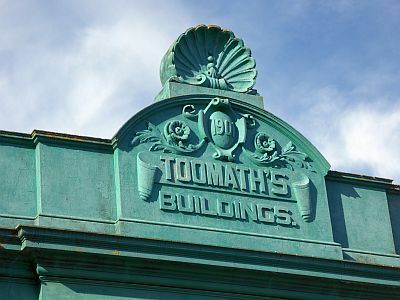 Like the Toomath’s buildings. 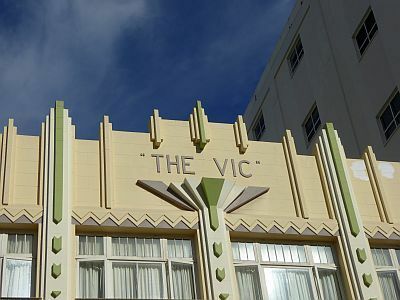 Or the top of ‘The Vic’. None of this is unusual or new. 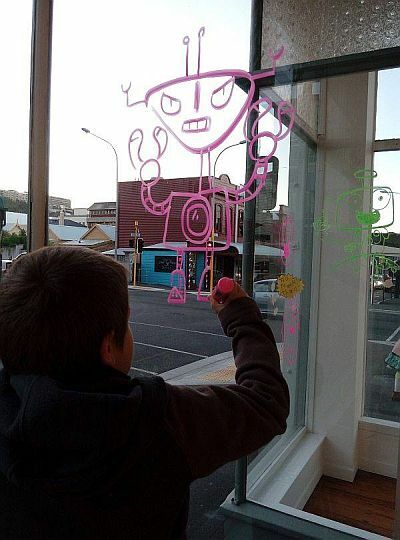 It was a fairly typical year in Wellington. 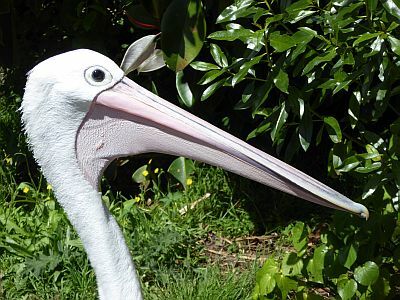 In April, we lost Lanky the pelican. So long, old fella. Some more pictures. 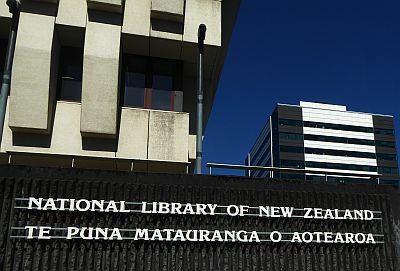 The lovely lettering outside the National Library. 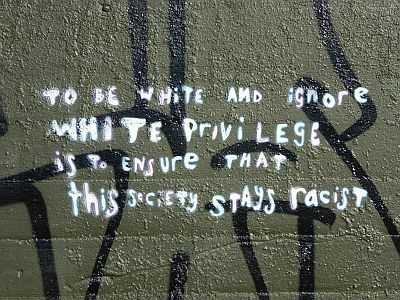 A reminder that graffiti are the original social media. The inside of Thistle Hall back in July, during my son’s art exhibition. Finally, a view of the Beehive with novelty sea urchins. This is it for this blog for this year. In my other usual haunt, at Overland, we wrapped up proceedings with a collective post, while the Summer issue has hit the shelves and is graced by the artwork of the remarkable Sam Wallman. You could get that for Christmas. Or Don’t Dream It’s Over. Or the new Tell You What. It is hard for a literate culture to remember what it was like to be an oral one, just as it’s hard to cast one mind’s back to the time in one’s childhood when words on a page were meaningless ink stains. Learning to read changes everything. Learning to write dispenses with practices for transferring information developed across dozens if not hundreds of generations. Entire architectures of knowledge crumble, or become fixed in time. Sometimes, if you’re lucky, you can still visit them. I went to a lot of churches, growing up. My parents didn’t care for religion but loved art. The inside of a Christian temple is one of those architectures (a carved wharenui is another): our universe shrunk to the size of a building and turned inside out. The ceiling is the sky. The walls and the windows are surfaces onto which the landscape is painted, sculpted or carved. These scenes are almost always stories without words, or sometimes there are words but they are part of the picture, magical symbols that are not for reading. 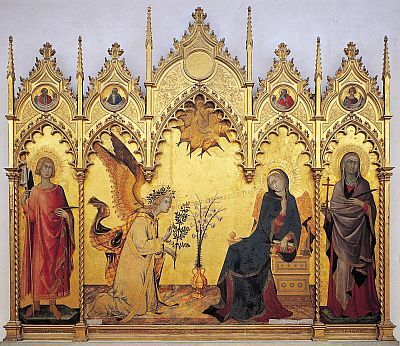 Like in the Annunciation by Simone Martini, in which the words of the angel – Ave gratia plena, dominus tecum (‘Hail, woman full of grace, the Lord is with you’) – are painted in gold and visually spoken as if in a comic book. Viewing these artefacts, we are asked to imagine what it would be like to live in a culture in which literacy was the preserve of the few, or of no-one at all. 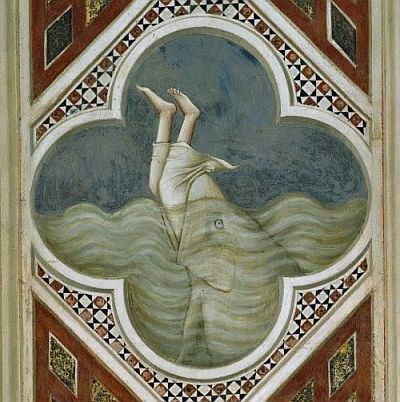 Nowhere I have been more keenly aware of this temporal displacement than the first time I visited the Scrovegni Chapel painted by Giotto in Padua. 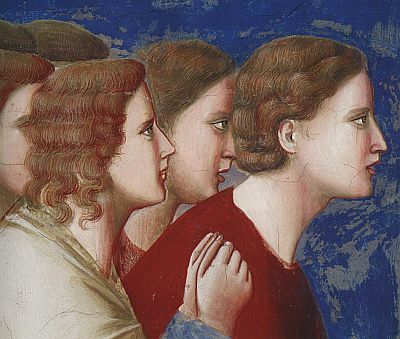 The legend is that Giotto himself was an illiterate shepherd, discovered by Cimabue – one of the foremost painters of the thirteenth century – after he had painted his flock onto a rock. 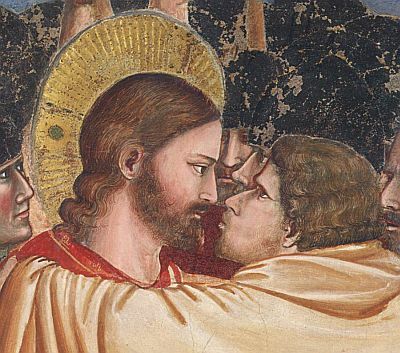 It’s not true, of course, to the best of our knowledge he was born in a reasonably well-to-do blacksmith’s family, and didn’t even do his apprenticeship with Cimabue. But I grew up thinking it was true, which added to the sense that his works might have come from a world of pure image, unencumbered by words. The chapel itself was erected around the year 1300 by a banker, Enrico Scrovegni, ostensibly in order to earn his late father a discount on the time he was due to spend in Purgatory for the non-mortal sin of usury. A more likely reason is that Enrico needed to erect a civic building worthy of his status, and that would in turn cement his position among the Paduan elite. 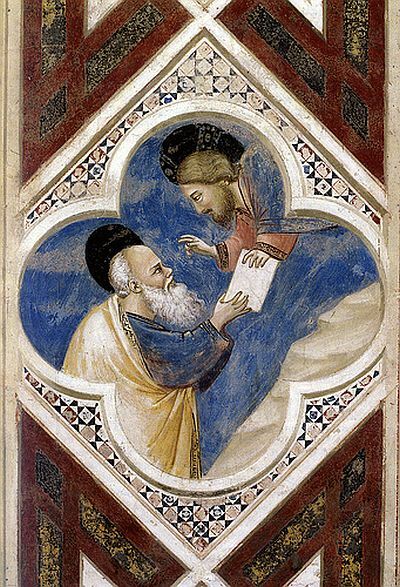 For this reason he invited the star painter of his time, who was already in town to work on the Basilica of Saint Anthony, to decorate the inside of the chapel. 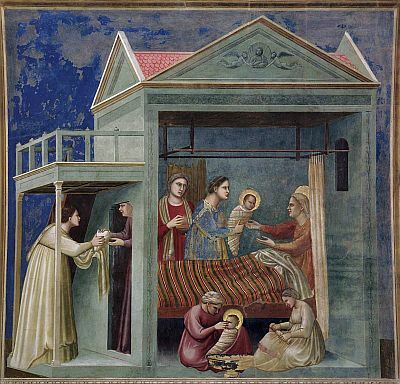 Inside of two years, Giotto produced one of the highest single examples of medieval art, an ark containing the distilled thought and aesthetics of the epoch. 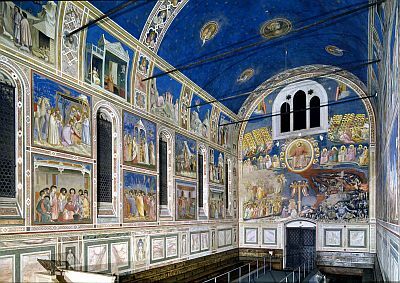 In this the chapel resembles Dante’s Divine Comedy, another world-containing work of art produced in those very same years. 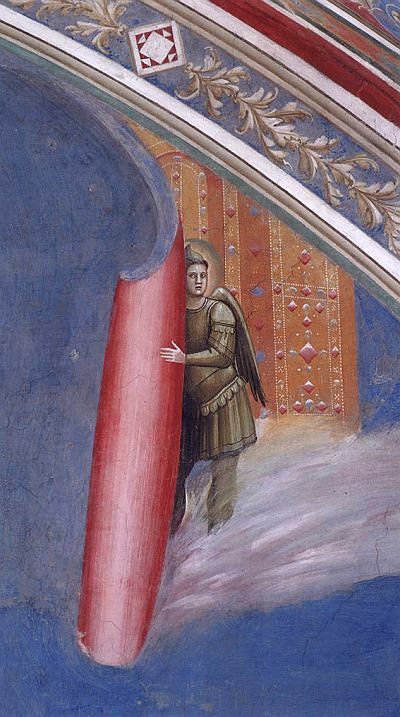 There is in fact some speculation that Dante visited the chapel, and may have drawn inspiration from its representation of heaven, the judgment and hell. The world is a book and the church is a book that is the world. 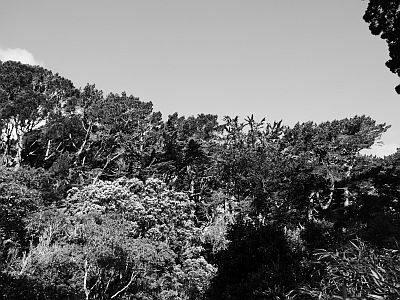 Its walls are its pages, to be read not in a fixed order but as if finding one’s way out of a forest, along a winding path that loops onto itself, finally reaching a clearing. There are five recognisable chapters: the story of Joachim and Anne (Mary’s parents); the story of Mary; the life of Christ; the passion, death and resurrection of Christ; and finally, on the wall opposite the entrance of the chapel, the Last Judgment. All of them require of its readers a pre-existing knowledge of the stories. 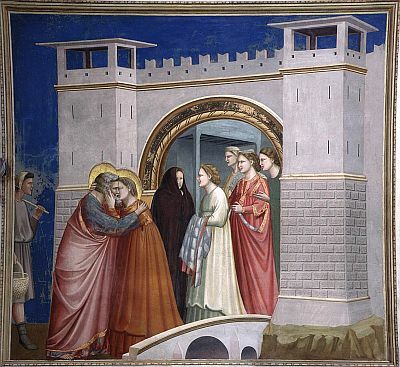 There is no caption to let you know that these are Joachim and Anne meeting at the Golden Gate of Jerusalem. Nor any extra-textual clues to inform us this panel depicts the birth of Mary. 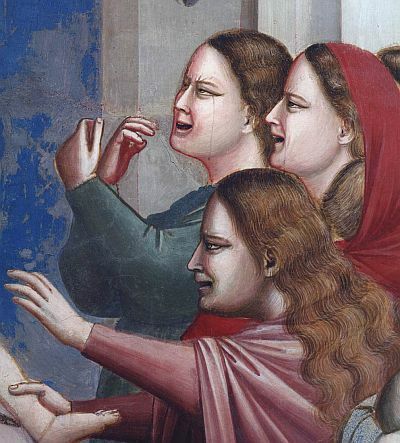 Conversely, the fact that the stories come from a known, rote repertoire would have enabled the public of the time to appreciate Giotto’s inventions, his departures from the norm. 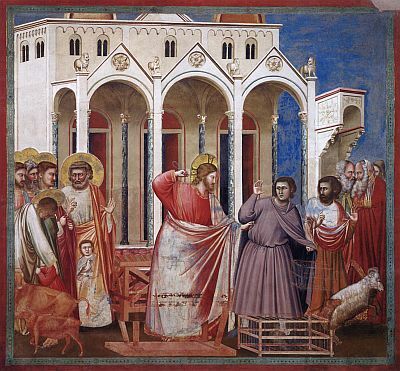 Like when he made the scene of the chasing of the money-lenders from the temple contemporary by setting it in Venice. There are, besides, internal references, symmetries and inversions between panels on opposite walls that complicate each narrative, making the whole read like a story never heard before. 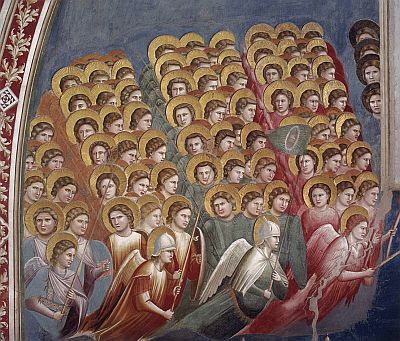 The Scrovegni Chapel is one of my favourite places on Earth but I visit it like a stranger, unable to grasp but a fraction of the effect it might have had on its contemporaries. Imagine living in a predominantly visual culture and yet having so little access to complex imagery. 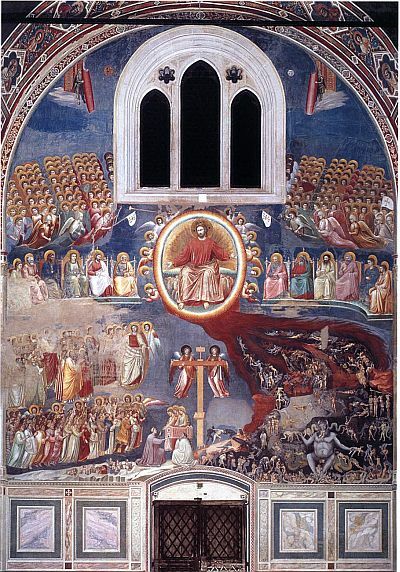 How much more real and at the same time alien, supernatural would those scenes seem; how much more urgent the great fresco of the final Judgment, a vista into an eternal future not long from now. And then, after that, a new city in a new world, about to revealed as the great canvas of the heavens is pulled back, or perhaps a page is turned. The book is infinite worlds and the world is infinite books. 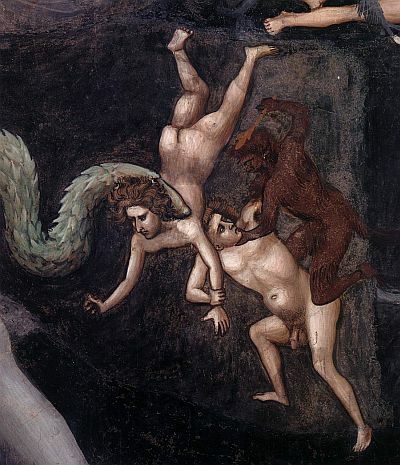 Always in the folds of the superficially narrow, bleak, oppressive worldview of medieval Christian Europe hides the promise of another world, unknowable, alien, like the sea in which Ulysses and his men venture at the end of the twenty-sixth canto of the Inferno. The chapel that is a book that is a world can only be viewed by appointment now. It has suffered from the passage of time and of too many people, no longer devout to its teachings but rather – like my parents – wishing to enjoy it as a work of art. Before we left for New Zealand, my mother gave my partner a beautiful monograph of the place: the book of the chapel that was already a book. And so this is how we visit it now, in near-perfect reproductions under ideal lighting conditions, with the ability to pore over details that an ordinary visitor couldn’t hope to make out. In this form, the book fractures in its component phrases. The crowd outside the temple during the bringing of the rods. The crude, cruel heap of the innocents. Some of the women who tried to protect them. Jonah and the whale (a shark, more like). Moses receiving ‘a package’ (okay, it’s the stone tablets). 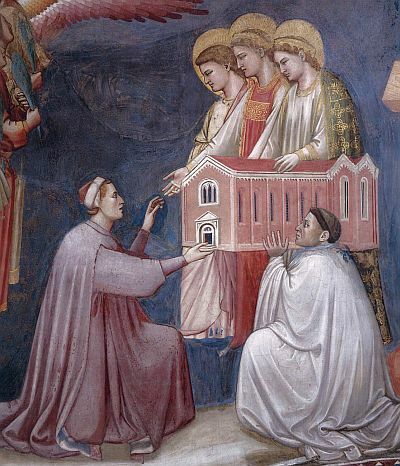 Enrico Scrovegni donating the chapel to Mary, possibly the first example of the portrait of a donor in art history. The throngs of the saved, looking suspiciously like an army. Versus these folks, who aren’t doing so well. Enjoyable, precious as the experience of reading our book is, it is not like being there, nor will it ever be like being then: at the time in which the chapel was built and decorated, when it would have truly appeared to its faithful visitors as a scale model of the finite Ptolemaic universe, with the Earth on which they walked at the centre. Back when the world really was a book. My new piece this week is a political obituary of John Key for Overland. Below is another piece I wrote this year for the magazine, following the latest attempts to reveal the identity of Elena Ferrante.